A real surprise to open my mailbox and find Ernie Koy responded so kindly and quickly to my autograph request. Inside he signed all 3 cards and told me his fondest moment playing for UT was the 1965 Orange Bowl victory over Alabama, a game in which Koy ripped off a 79 yard touchdown run and finished with a school record at the time, 24 carries for 133 yards. I then realized that he had played in BOTH the ’64 Cotton Bowl and the ’65 Orange Bowl, and had forgotten to include another card. 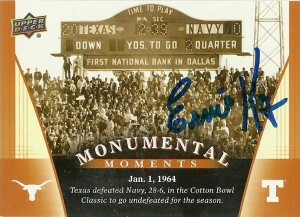 I later wrote him back to get the final Memorable Moment card signed (in black). 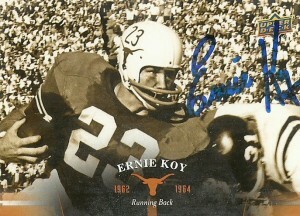 Ernie Koy Jr. and his brother Ted, were part of a family father/sons lineage combo that enjoyed much success through the University of Texas, much like the McCoy family does today. 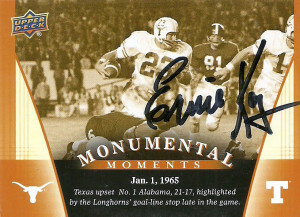 A wingback in the Longhorns much touted Wishbone offense under head coach Darrell Royal, Ernie converted to fullback and led Texas in rushing his Senior season with 707 yards and 10 TDs in 1964. He was also an accomplished punter. A part of the 1965 NFL draft, Ernie was taken in the 11th round by the New York Giants. 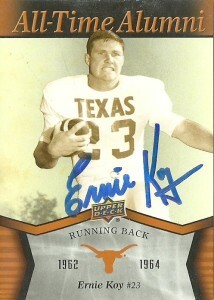 A multifaceted player, Ernie not only was able to play runningback, but also punter and returner as well. As a member of the shortlived ‘Baby Bulls’ backfield for NY, Koy was a member of a group of basically 5 fullbacks that were straight ahead in-line rushers, and all were roughly the same size and possessed great hands. Upon arriving in New York, Koy was named starting punter and played Flanker throughout his first two seasons. After a move to Halfback, in 1967 he earned his only Pro Bowl berth, rushing for 704 yards on 146 carries, and 4 touchdowns. He retired after the 1970 season. Over his career for New York, Ernie was a jack of all trades as evidenced by his statistics that not only included rushing and receiving, but punting, kick returning, and an occasional pass here or there. Ernie is an upstanding member of the Texas community. He’s been a successful banker working from the ground floor up, and has given a lot of his time back through his charitable activities. He lives outside of Houston on a 200 some odd acre ranch, and has a masters in education.